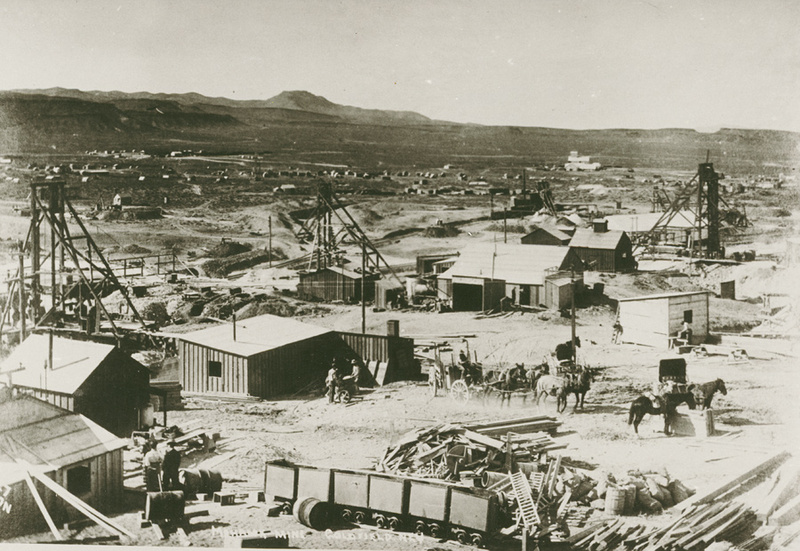 Before there was Goldfield, there was Tonopah, located 26 miles north of Goldfield. Except Goldfield didn’t exist yet. In May, 1900 Jim Butler discovered a high grade silver deposit where Tonopah sits today. Glory holes of some of the ledges can still be seen today along Florence Ave. Tonopah quickly became full of prospectors, many leasing ground from Jim Butler, which was a new practice in mining that Jim had starte d. Total production in 1901 was over $3 million dollars, at about $12.40 a troy ounce silver. From 1901 thru 1940 Tonopah recorded production of $148,970.400, with a silver to gold ratio of about 86 to 1. Goldfield during this same period had a recorded production of over $90,000,000, mainly in gold. In today’s prices, that’s about $1.8 billion dollars, Goldfield’s gold to silver ratio is about 3 to 1. In the early days of Tonopah in 1902, a Paiute Indian by the name of Thomas Fisherman was showing specimen ore, “picture rock”, to would-be grubstakers to help keep himself in beer & whiskey. Fisherman received a ten dollar grubstake from Jim Butler and Tom Kendall, and was told to locate a claim where the rock was found. Tom immediately got drunk, and the only information they could gather from him was that the rock was found thirty miles to the south. Later after giving up on Tom Fisherman, Kendall and Butler grubstaked two young men to locate the place where Fisherman had found the gold specimen, they were Harry Stimler, half Shoshone Indian, and William Marsh, both native Nevadans from Belmont. Gran Pah in Shoshone means great water, others say that it meant this camp was going to be the granddaddy of all gold camps. On December 4th, 1902, Stimler and Marsh located three claims on the north ridge of Columbia Mountain, The Sandstorm. Kruger and May Queen, and named the new mining district “Grandpa”. The first claim was named Sandstorm because they located it during a sandstorm. The third claim, May Queen, was named in honor of Stimler’s brother’s wife May and his own wife’s first name Queen. On October 20th 1903 a group of thirty six prospectors and investors organized a meeting to establish the town site. They elected Al Myers of Cripple Creek Colorado as President, and Claude M. Smith a former school teacher from California as Recorder. During this meeting they voted to change the Mining District and town name to Goldfield. 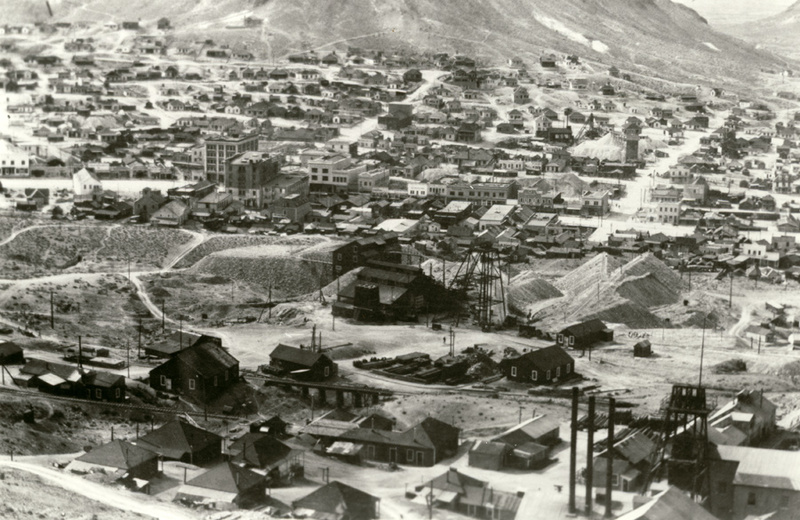 They felt the mining district and town would be easier to promote with a name like Goldfield, instead of Grandpa. 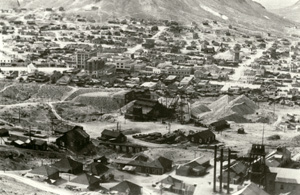 Thus the town of Goldfield was born. 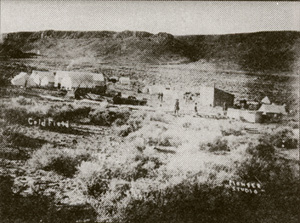 Goldfield November 1903, Main Street first set up with tents in September 1903, after moving them there from Rabbit Springs when a well was dug. This is the place where the town organizational meeting took place October 20th, 1903.